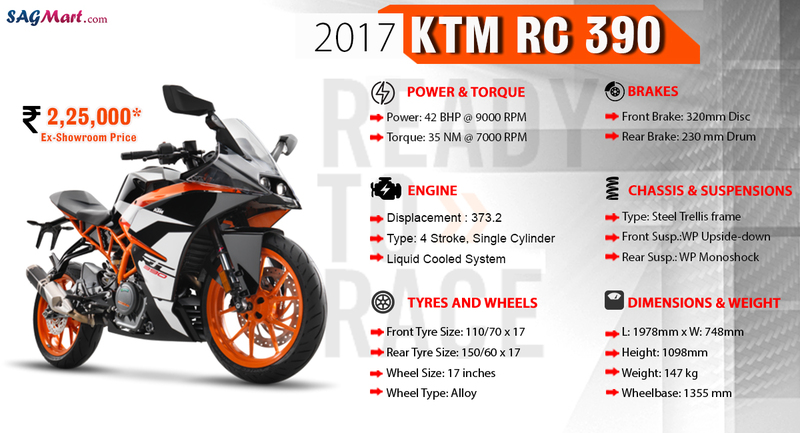 2017 KTM RC390, a more aggressive and appealing version of the track focused sports bike. It gets a new black orange paint job with white graphics. Powered by the similar 373.3cc, liquid-cooled motor of the last model, the motorcycle is now Euro-IV compliant with the fitment of a two stage slung exhaust canister. The reworked engine spits out the similar power output of 43.5PS. Whereas, the torque figure has gained a bump of 1Nm. The KTM RC 390 comes with sharp handlebars that gives a very aggressive riding posture for the riders. The motorcycle is blessed with a split seat, which is very soft and gives a comfortable sitting position to the rider and pillion. Although the maintenance of this bike is good, but you need to visit a service center after a long ride, as the manufacturer specifies service intervals at 4,700 miles and valve adjustments are required at 9,300 miles. In the all terms, the 2017 KTM RC 390 is one of the best motorcycles that is made for the track. The motorcycle has top notch riding quality and performance. Furthermore, The motorcycle has good value for your money.